This recipe caught my eye for two reasons: no-knead and cheese. What more can a girl ask for? 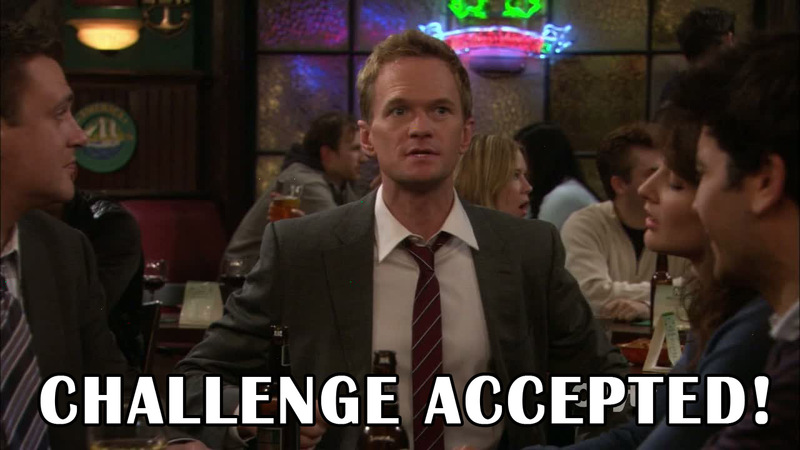 I braced myself for failure while daring to hope that this bread could actually turn out. Ready to test your bread making skills? Let’s get started! 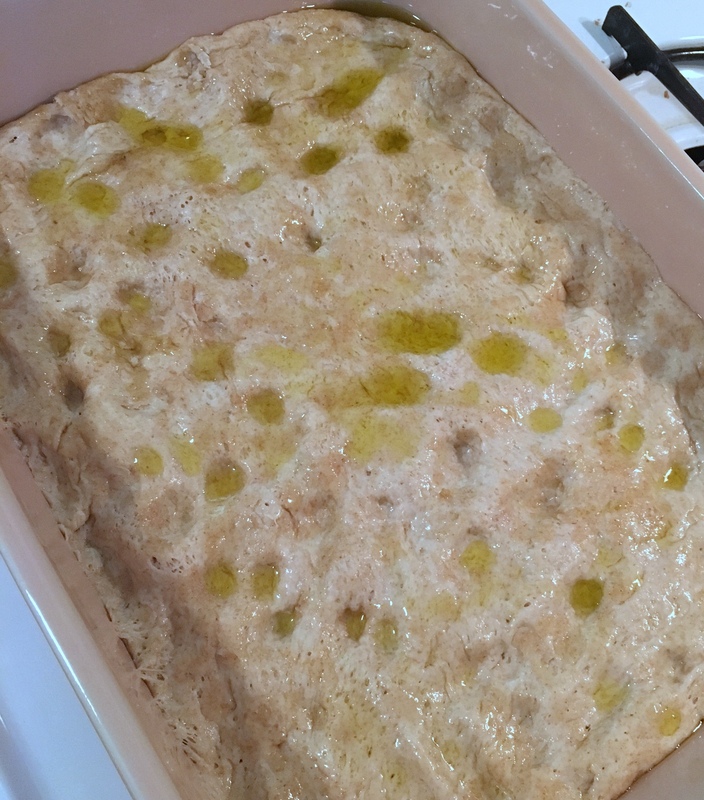 Gather a bottle of olive oil, all-purpose flour, whole-wheat flour, salt, active dry yeast, Asiago cheese, a large shallot, and some fresh thyme. 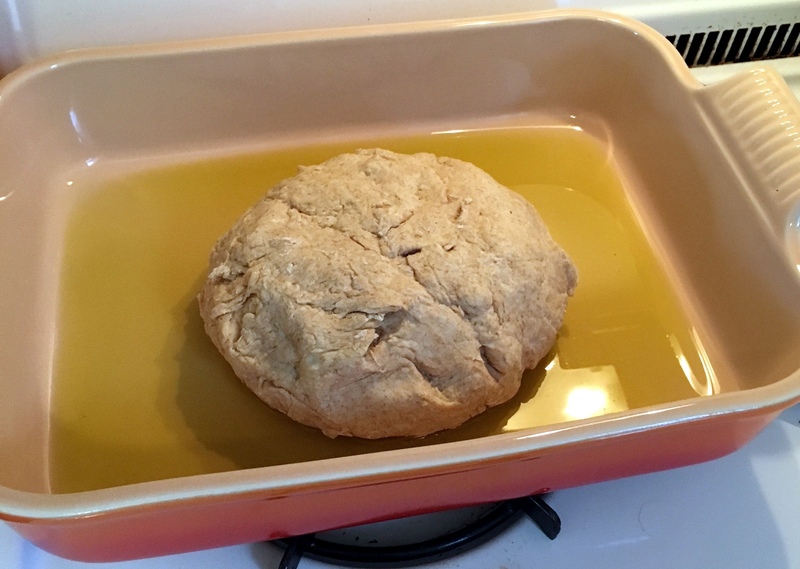 Pour 1/4 cup of olive oil into the bottom of a 9″ x 13″ baking dish. In a large mixing bowl, whisk 2-1/2 cups all-purpose flour, 1 cup whole-wheat flour, and 2 teaspoons salt. In a separate medium mixing bowl, whisk 1-1/2 cups warm water, 1 tablespoon dry active yeast, and 3 tablespoons olive oil. Create a well in the center of the flour mixture, add the yeast mixture and use your hands to gently form a sticky dough ball. Place it in your baking dish. Cover with a damp towel and let it rise for 2 hours in a warm place. 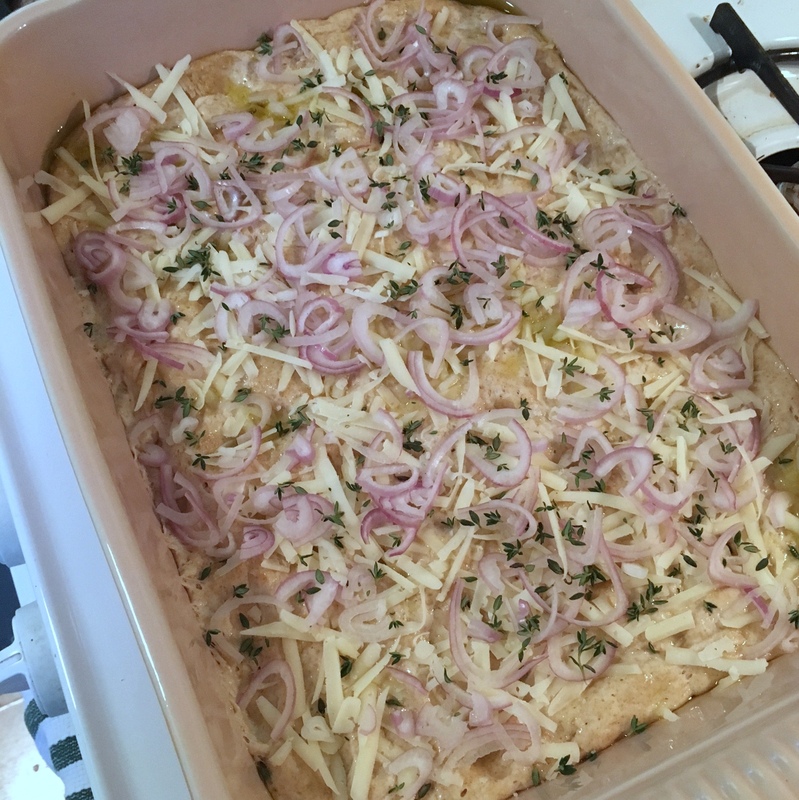 While the dough is rising, shred 3/4 cup Asiago cheese, thinly slice 1 large shallot and gather 2 teaspoons of fresh thyme leaves. Once the dough has risen, wet your finger tips and press the dough out to the edges of your baking dish. Also use your fingers to create an uneven, dimpled texture the top of the dough. Drizzle with an additional 3 tablespoons of olive oil. 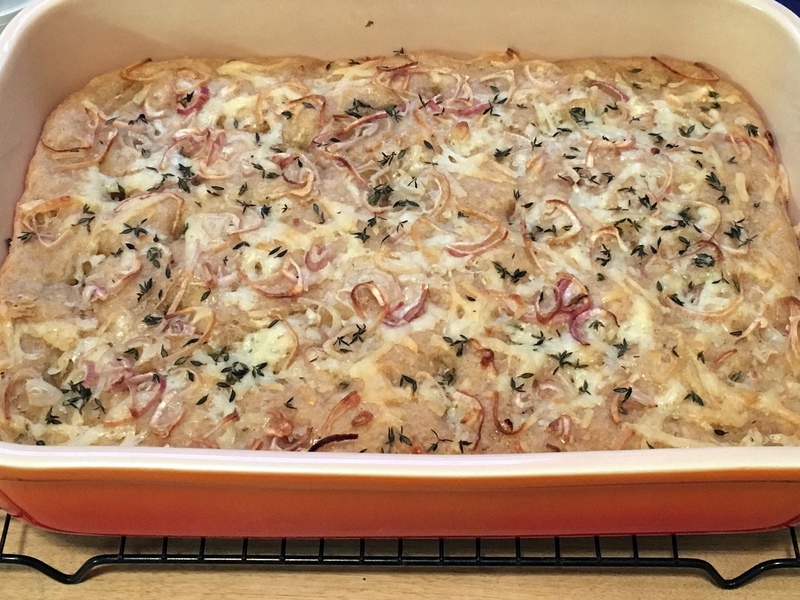 Top dough with the Asiago cheese, shallot slices and thyme leaves. Bake for 30-35 minutes or until the top is golden brown and cheese is melted. Let cool for at least 10 minutes before cutting and serving. I had a good feeling this would turn out well when I slid it into the oven. Happy mouths agreed! Enjoy it as a savory side to any meal. 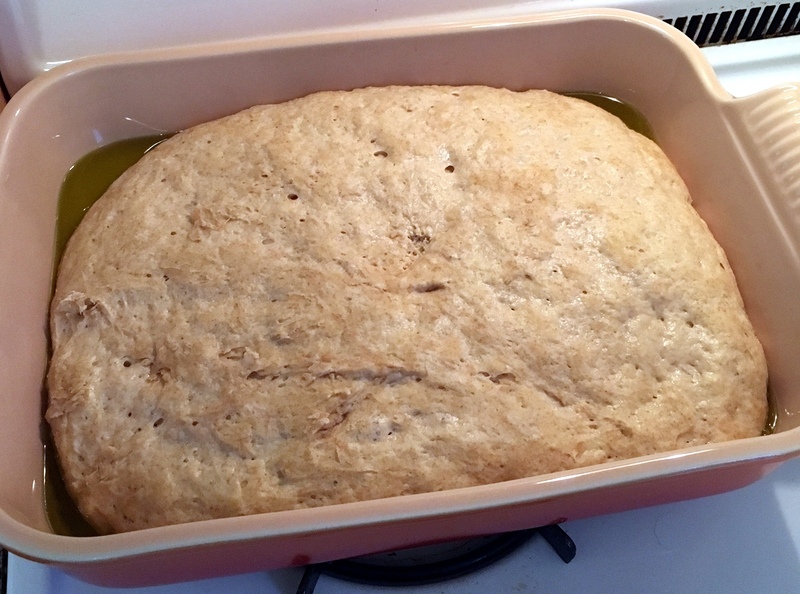 1) Pour 1/4 cup of olive oil into the bottom of a 9″ x 13″ baking dish. 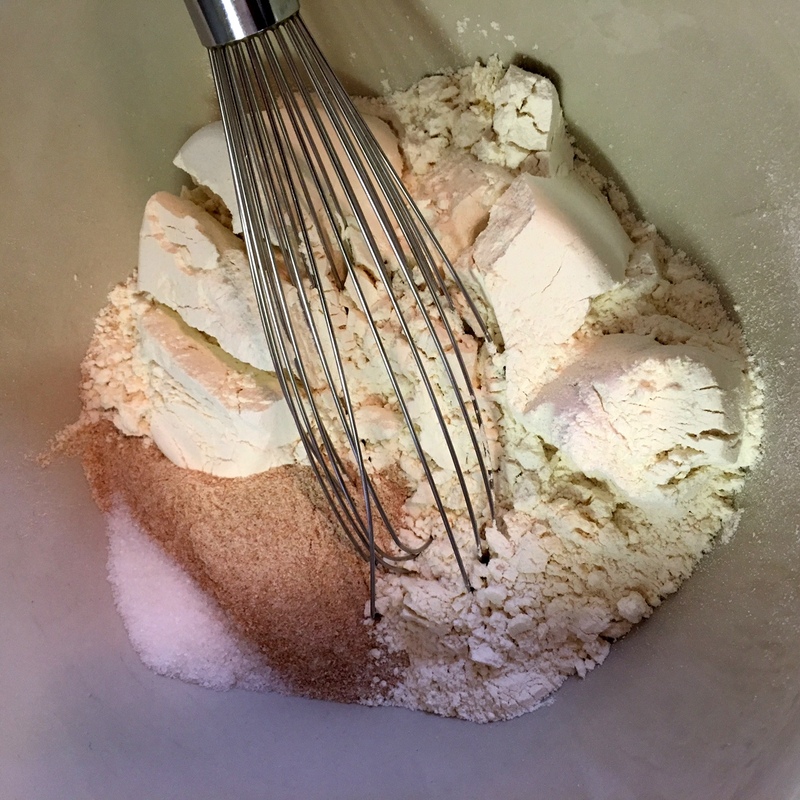 In a large mixing bowl, whisk 2-1/2 cups all-purpose flour, 1 cup whole-wheat flour, and 2 teaspoons salt. 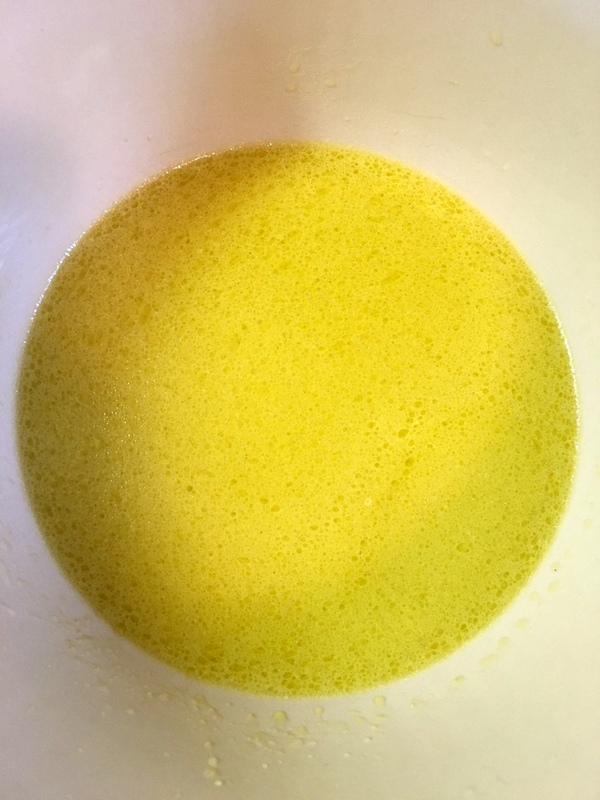 In a separate medium mixing bowl, whisk 1-1/2 cups warm water, 1 tablespoon dry active yeast, and 3 tablespoons olive oil. Create a well in the center of the flour mixture, add the yeast mixture and use your hands to gently form a sticky dough ball. Place it in your baking dish. 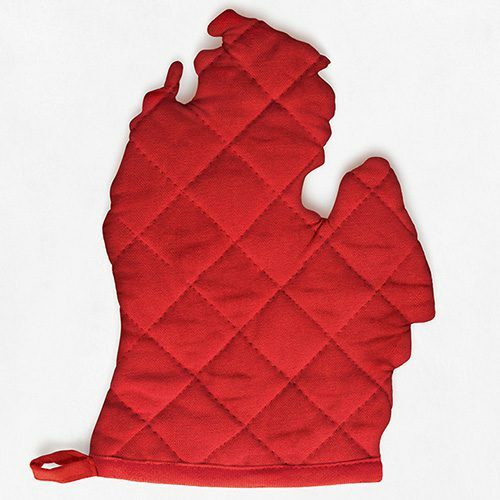 Cover with a damp towel and let it rise for 2 hours in a warm place. 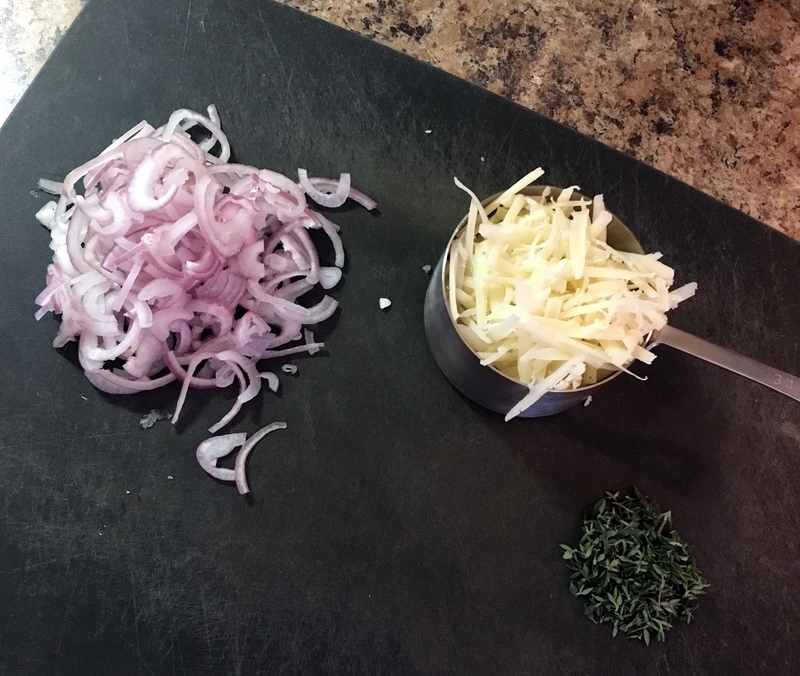 2) While the dough is rising, shred 3/4 cup Asiago cheese, thinly slice 1 large shallot and gather 2 teaspoons of fresh thyme leaves. Preheat your oven to 375 degrees. 3) Once the dough has risen, wet your finger tips and press the dough out to the edges of your baking dish. Also use your fingers to create an uneven, dimpled texture the top of the dough. Drizzle with an additional 3 tablespoons of olive oil. Top with the Asiago cheese, shallot slices and thyme leaves. 4) Bake for 30-35 minutes or until the top is golden brown and cheese is melted. Let cool for at least 10 minutes before cutting and serving. Ok I am pinning this. I really want to try it. It looks amazing. I too have screwed up many things baking. Level with me here. This was pretty easy, for real?